In Liechtenstein there are only two long climbs – the road to Malbun and the road to Gaflei. There are some variants possible, but basically there are three different places to start both of these climbs along the main national road through the country, namely Feldstrasse (466m) to the south, Meierhofstrasse (457m) in the middle and from Vaduz (471m). The climb from Feldstrasse joins the main road up the mountain, the Meierhofstrasse, after a short while and the road climbs in several serpentines (or curves) to Triesenberg, which is the central village of the mountainside where several roads meet. One could take some slight short-cuts, but guess most will forget them anyway and it makes most sense keeping to the main road even if it can be a bit busy with cars (more calm above Triesenberg). One turns off the road to Malbun a bit above the village to Gaflei and the road goes steeply to the end at a parking at Gaflei (1490m). To the right a gravel road continues up and the road is fairly good even if a bit step. It passes through a private house area (nice man there on my visit) and continues in some more serpentines to the pass. The gravel road does not go far down the other side and you better return back down the same way. The climb from Vaduz (just showing the steepest variant there) goes on the road by the castle where the prince lives. The climb briefly joins the main road to Malbun for a few metres before taking the same road to Gaflei. This is the steepest variant and have not tried that myself. Other comments This is the most exciting of the two climbs in Liechtenstein and it has the best views down over the Rhein valley into Switzerland. A very nice climb the higher up you go. It would have been nice if the climb coul have been used as circle tour over the Kulm (1433m). 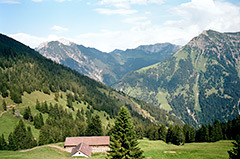 See Malbun (1705m) for more information on the Kulm road.